The objective is to investigate the decay of charge in a capacitor when it discharges through a constant resistance. The discharge processes of two identical capacitors connected in series or parallel are also investigated. 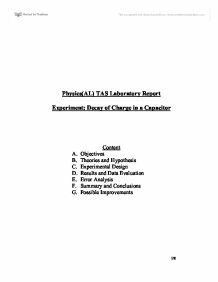 From the results obtained, determine the relations between discharge rate, capacitance and resistance. At any time t, let VR and VC denote the potential difference across R and C respectively, I denotes the current through R, Q denotes the charge remained in C.
When . Hence Q0 is the initial charge in capacitor. Practically, the charge in a capacitor cannot be measured easily at any time. Therefore current, instead, can be measured. where I0 is the initial current through the resistor. Therefore theoretically, it is known that the decay of charge through constant resistance follows an exponential decay pattern. That is, the discharge rate is always proportional to the charge remained. 3. Open the switch so that the capacitor starts to discharge through the resistor and multimeter. 4. Start the stop-watch when the multimeter reading reached 40μA, then record the time reading for every 5μA decreased. Stop timing after the reading reached 5μA. 5. Repeat procedures 2, 3 and 4 twice to obtain the arithmetic mean value of time t.
6. Plot a graph of current I against time t for the data obtained in procedure 5. 7. Plot a graph of ln I against t.
8. Repeat the experiment twice with the capacitor replaced by two identical capacitors connected in series or parallel. 9. Plot the data obtained in procedure 8 on the same graph in procedure 6. Potential difference V across battery = 4.3 0.05 V.
Current I through resistor after capacitor has fully charged up = 43 0.5 μA. which agrees with the labelled value on the resistor. Also, the internal resistance of multimeter is not significant. Table 1 shows the data obtained in procedure 5. Using the data, graphs of I against t (Graph 1) and lnI against t (Graph 2) are drawn. 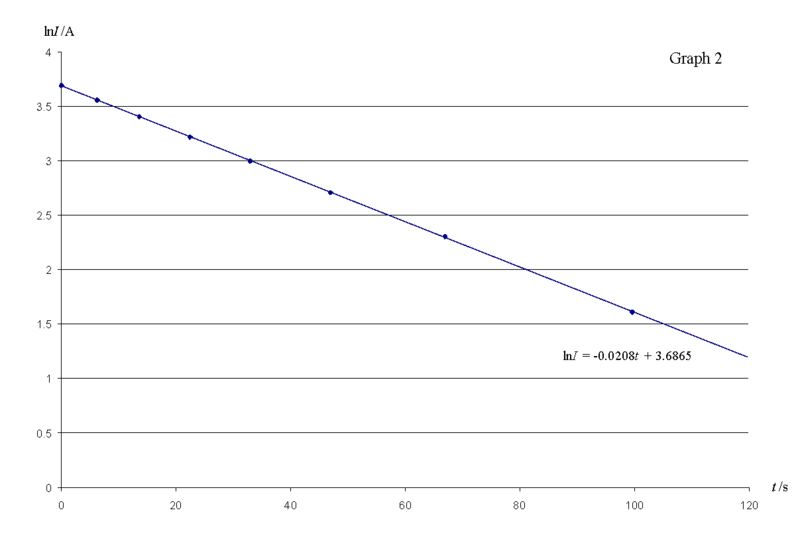 Graph 1 shows an exponential decay curve and Graph 2 shows a straight line with negative slope. 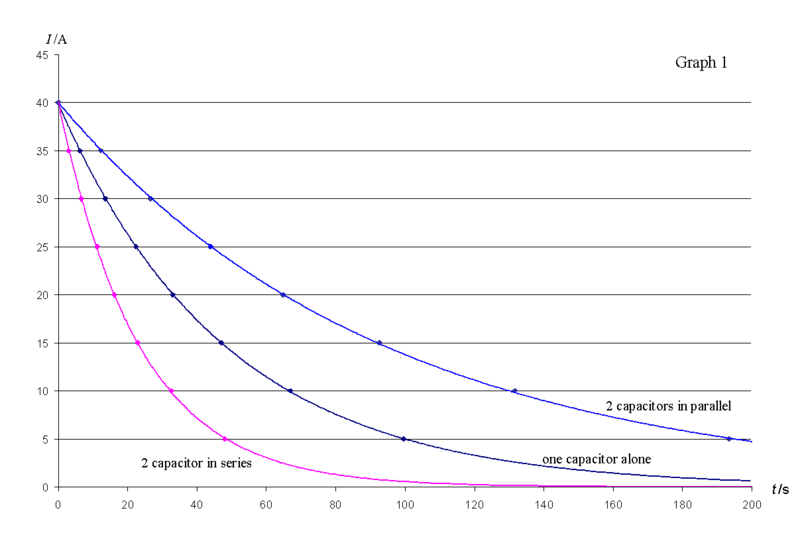 Also, when two identical capacitors are connected together in series or parallel, their discharge processes still follow an exponential decay. In the case they connected in series, the time constant is approximately halved. And when connected in parallel, the time constant is approximately doubled. All of the above results agree with our experimental hypothesis . Therefore we can conclude that the hypothesis is accepted by our experiment. The sources of error are mainly come from the reading of multimeter and the timing by stop-watch. Both of them are quite significant. To reduce the error from reading of multimeter, we can use a multimeter with more detailed scales or one with digital number displays and higher sensitivity. Reaction time of human is a random error. To reduce the error from timing, we can repeat the experiment a few more times. According to the Law of Large Numbers, the arithmetic mean of time can be more accurate as the number of timing increases. An alternative method to reduce the errors is using a data logger. A data logger can be connected to an ammeter to replace the multimeter, so that the change of current over time can be recorded more accurately. This increases the accuracy of reading ammeter/multimeter and at the same time avoids the effect of reaction time of human. Layout - All the components of a good report is there, the layout is clear and the section headings helpful; but a better flow from one section to another would give an easier read. For example, you mentioned objectives at the beginning, but then went off to detailing the theory (and rightly so), and never went back to your objectives again - maybe try to incorporate your objectives into your procedure, it shows to the teacher/marker that you understand the relevance of each step. The report is also good in the sense that there are no gaps in the explanation. It is very easy to jump from one step to the other while skipping a step, but that is not the case here - it is logical, with no gaps in the logic. At the end of each section, there seems to be an abrupt end, and then you are tossed to the next section; this is A-Levels, so it doesn't have to read like a professional report, but as a practice to write better quality reports, always try to show how one section relates to another, or how one section flow into the other. Even just a simple line to say Ã¢â‚¬Å“Now that we know the theory behind a single capacitor, we will apply this to two capacitors, and then three. 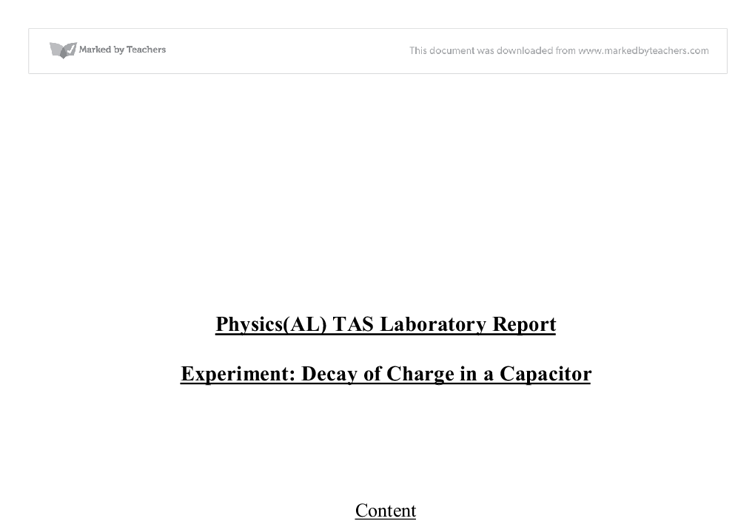 After, we will try to establish the general rule for capacity discharge for any number of capacitors.Ã¢â‚¬Â Putting things into context makes the report read better, as well as showing understanding. Analysis and quality - The techniques, the theories, the calculations are all accurate, and the explanation given was good and logical - the section on the theory was particularly good. The author has made his objective clear at the start, and have followed a logical and comprehensive breakdown of the steps required to investigate it. There are no obvious errors in grammar or spelling. One improvement maybe to have the graphs close to the text where it is mentioned from, so that people can see the graph as they read the text; otherwise, have captions with the graphs to explain what it shows. One of the best things I like about this report is that it shows the author understands - he/she knows the limitations of the experiments, taking into account errors and significance. Overall, this is a very good report. All the content is there, the major way of improving is to lay it out better, establish a flow in the report, and once in awhile refer back to the question. axis and the slope line thus the EMF of the cell ? is 1.54 V ( y- intercept) and the internal resistance of the cell is should be in negative gradient of - 0.4 ? (G.Alex) Moreover according to the formula given in the procedure V = ? Single Phase Transformer (Experiment) Report. * I'2R1 is the voltage drop associated with the winding resistance and is in phase with I1. * I'2X1 is the voltage drop associated with the total leakage reactance and is in phase quadrature with I1. * Cos ?1 and cos ?2 are the primary and secondary power factors respectively. When looking a the results the discharging begins at 10 v but the charging ends a t 11.25v, the capacitor was not fully charged when Discharging. 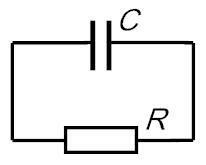 This is due to the internal resistor being in parallel with each other, which results in the total internal resistance being half of the total internal resistance of a series circuit with two cells, which also halves the current and therefore means the e.m.f is also halved. In my actual method I will only record the temperature for between 5-10 minutes with the powerpack on and then off. This is because the temperatures reached over a longer period of time such as 15 minutes as used in my trial run produced a maximum temperature of 63 C.
I will also compare where the curves peak; at what distance does the curve peak (earliest/latest) in relation to the load resistance. Method: The following method was used to gain the data I need to process. Knowing how the data was collected will help me ascertain where errors may have occurred and how they may have been prevented. The latent fusion would be compared to the known value. Introduction:- When a solid has reached its melting point, additional heating melts the solid without a temperature change. The temperature will remain constant at the melting point until ALL of the solid has melted.